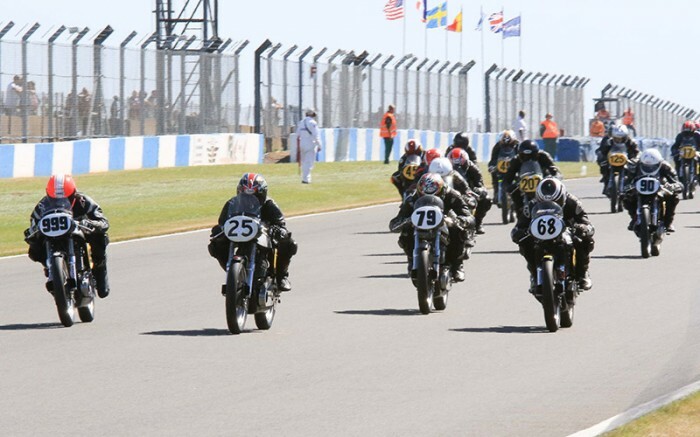 Former Senior Manx GP winner Glen English won a tight battle of Manx Nortons to claim first place in the last of four Bonhams Lansdowne races at the Donington Classic Festival, riding the Works Norton equipe’s two-valve 500cc single. He led Chris Firmin, a 44-year-old therapist from Cornwall, over the line by just 0.689 seconds in a race a series that presents racing for pre-1963 bikes almost as they were raced in the Mike Hailwood and Phil Read eras. The meeting was also a success for Fred Walmsley, a technical guru of the Manx Norton and Matchless G50 British single-cylinder motors, who prepared the engines of both Firmin and English. The championship will be decided at the final round at Brands Hatch on October 8-9.